I’m sure a few other people do, or try to do this, so I’m not sure how unusual it is, but I thought I’d post about it regardless. I walk to work. Almost everyday. And usually (like a good engineer ;) ), if I do something repeatedly, I try toptimize it. With code, with life. So, now that it’s been a few months of walking to work in Seattle, I think I can present my learnings. I began by timing myself, so I have a fair idea of how long I take to get to work. This lets me leave as late as possible (not a morning person) while hopefully making it for meetings. After a few days of timing myself, I realized that traffic lights were the biggest factor in how much time it takes me to get to work. I could walk slowly or run, but if I didn’t make the light, I was blocked. As a result, an interesting strategy is to stay diagonally opposite from your end-point (that way you can take the traffic light to the front, even if the one to side is blocked - or vice versa). This is a good principle, but like with all real-world problems, doesn’t apply 100% to the real world. The only other useful decision is deciding between stop signs that let you through with a consistent delay, or traffic lights which may let you through with no delay (although you should stop and look both ways before crossing in any case). Now, on to the specific intersections. The first useful intersection is the blue dot. If I get on the other side of this road (north of E Pike St), then I can avoid the light at Boren & Pike. If I miss this (and walk at normal pace), I incur a delay of around 10-15 seconds. That’s boring. Now, for the fun part. It might seem like taking every traffic light that is open is going to be optimal (greedy approach), but the world doesn’t work that way (as stated earlier). This brings us to the second interesting intersection - the green dot. Here, if I stay to the east of Boren, I get to cross Pine BEFORE I would have if I was on the west of Boren. That’s because cars on Boren take a left turn and so, the signal for pedestrians changes later. So, it is always beneficial to stay on the east of Boren (going north) at this intersection. Next up is the black squiggly line, which until recently was blocked due to construction. This meant I had to get on the west of Boren before this. That can usually be achieved at either of the two intersections prior to it (on Pine or Olive Way). Then, you might have to cross at a red light (no idea why the light is red for both vehicles & pedestrians). The next decision is whether to cross back across Boren at Howell or not. This is only worth it if you can’t cross Howell, or you want to take the bus (pink). If Howell is not crossable (red light), then cross on Boren, and walk till the bus stop. A good way to figure out if the bus is coming (without an app) is to see how many people are around. If there’s no one, walking is probably going to be quicker (in that case, cross at Denny to the other side). If the bus is coming, take it down Fairview & get to work. It is usually good to be able to see the lights in front of you, so that if you are in a rush, you can run and make it. 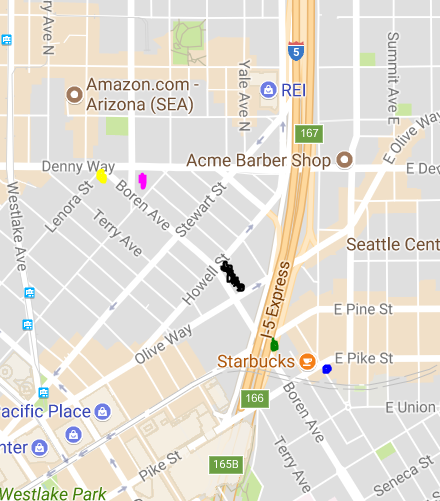 It is not possible to time the first light (the blue dot), but once you get onto Boren, you can time it almost perfectly so you hit all the lights correctly to Denny. This involves going straight on Boren till the black squiggly line and timing your crossing of Olive Way so you cross without stopping at Howell. Another partly unnecessary red light (at times red for both pedestrians & vehicles) appears just south of the pink mark). Then, you can jog on Fairview (west side of the pink mark) to cross Denny in one go from the west of Boren. Google Maps initially suggested crossing at the yellow dot (now blocked), but that was near impossible to cross, and waiting for an opening in traffic was slower than crossing at the traffic light. Bad Google! You can save upto 5 minutes everyday, and get to your meetings on time! If you find this weird, you are probably not alone. I also read on the way to work, thus getting in around 30 mins of reading a day).